I noticed the SD Mod 4 9mm AR-15 Upper Receiver on Brownells new product section so I spent a bit of time researching Stern Defense. I didn’t learn much. The only thing I was able to determine besides their contact information is that they are a pistol caliber AR-15 hardware manufacturer, and as regular visitors know we are big proponents of the platform. If anyone has feedback on the hardware or company please drop us a line! 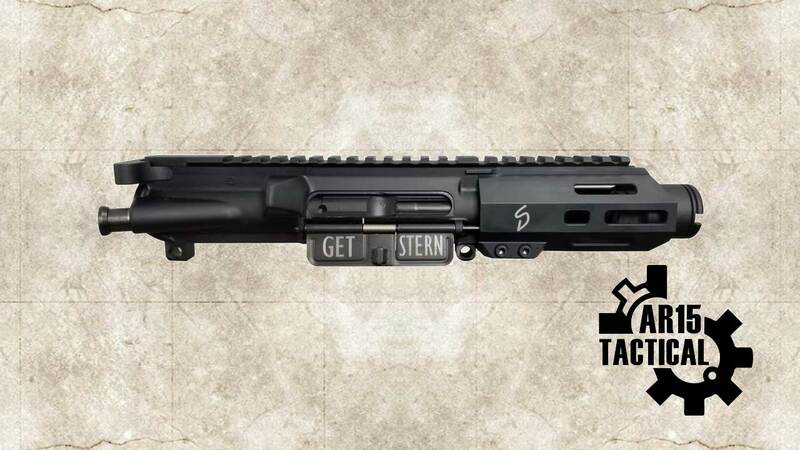 The Stern Defense SD Mod 4 9mm Upper Receiver is a complete, ready to go, upper receiver solution for those looking to spend less time building and more time shooting. The 4 inch, 1-10 twist, Melonite finish barrel, is free float in a 4in M-LOK handguard attached to a 7075-T6 forged aluminum receiver. On the end of the barrel mounted on the ½-36 threads is a 1.75” long, 1.2” diameter blast can designed to direct the short barreled blast away from the shooter. The free float M–LOK handguard from Stern Defense offers excellent ergonomics while remaining lightweight and strong. This handguard is M–LOK compatible to accept your favorite attachments. Features a secure clamp on mounting system that ensures that the handguard remains in place even under heavy abuse, sustained full auto fire, and shooting prone from a bipod. Machined from 6061 aircraft grade aluminum and hard-coat anodized for longevity and durability. These handguards also feature quick disconnect swivel holes. Also Included, Barrel Nut and Bolts. Smallest inside diameter 1.435 inches. Made with 8620 AISI steel and boasting a Mag-Phosphate finish, the Stern bolt fits into Mil-Spec and Glock-pattern upper receivers. It functions with Colt SMG, Glock magazines and it’s fully compatible with standard AR15/M16 charging handles. Comes fully assembled with all sub-components installed, including firing pin/spring/retaining pin, extractor, and extractor spring. Also included in bolt assembly is a proprietary center and roll pins. Our 9mm bolts incorporate our new bolt design which caters to single stage triggers with short resets. It also allows use with the JP silent captured spring. This bolt is compatible with the Law Tactical folding stock and the Echo trigger.